George Monbiot is known to millions for his newspaper commentaries, which are widely circulated on the Internet. 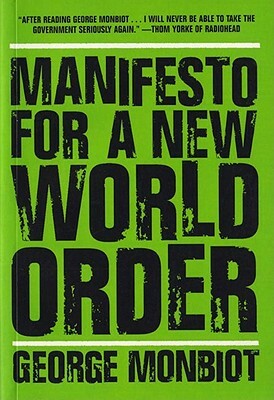 Now in paperback, Monbiot's Manifesto for a New World Order offers a plan for transforming the world into a decent place for all. All over the planet, the rich get richer while the poor are overtaken by debt and disaster. The world is run by a handful of executives who make the most important of decisions, concerning war, peace, debt, development, and the balance of trade. Without democracy at the global level, the rest of us are left in the dark. George Monbiot shows us how to turn on the light. Emphasizing not only that things ought to change but also revealing how to change them, Monbiot develops an interlocking set of proposals that mark him as the most realistic utopian of our time. With detailed discussions of what a world parliament might look like, how trade can be organized fairly, and how underdeveloped nations can leverage their debt to obtain real change, Manifesto for a New World Order offers a truly global perspective, a defense of democracy, and an understanding of power and how it might be captured from those unfit to retain it. George Monbiot has been persona non grata in seven countries, was sentenced in absentia to life imprisonment in Indonesia, has been shot at, beaten up by military police, shipwrecked, and stung into a coma during seven years of investigative journeys across Africa, Asia, and the Americas. He is the author of five books, including, most recently, "Captive State" and "Amazon Watershed."